Capcom has a strange relationship with Mega Man. What was once a shining blue jewel in the heyday of video games, Capcom’s interest in producing a newer, non-retro retread seems to have waned. Series creator Keiji Inafune left the company, a move that gave him the autonomy to develop a Kickstarter pitch for a modern spiritual successor to Mega Man. Thirty days later, Mighty No. 9 was funded to a song of over three million dollars. Capcom’s lethargy towards Mega Man doesn’t mean they’d ignore opportunities to repackage the older titles for a new audience. Thus, Mega Man Legendary Collection was born. Optimized for current gen machines, the set packs together the first six Mega Man adventures (two less than the previous collection, Mega ManAnniversary) in all their retro, rage quitting glory. The games included with the collection set span Mega Man’s history on the Nintendo Entertainment System from 1987 to 1994. Few changes were made to the games during this period because one doesn’t fix something that isn’t broken. The visuals got better and Mega Man developed new skills, but the gameplay that defined the franchise went untouched. The story for each game followed a now legendary theme. Two scientists, Dr. Light and Dr. Wily, are geniuses in the field of robotics. While Dr. Light toiled away in the laboratory to create machines for good, Dr. Wily built robots to help him take over the world. When Dr. Wily’s army of robot masters are unleashed upon the world, Dr. Light creates Mega Man, a robot that looks an awful lot like Astro Boy, and sends him on a quest to stop Dr. Wily’s malevolent machinations. 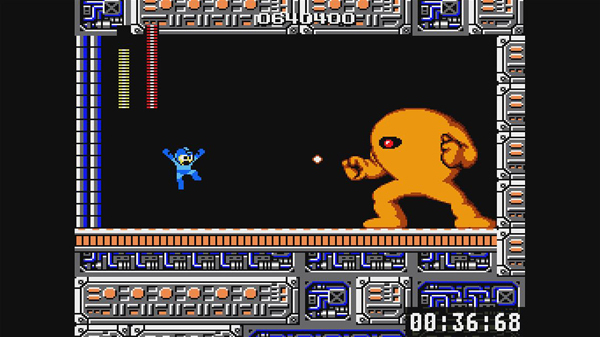 Mega Man was a unique platformer at the time because it had a specific method of play. Rather than blast through a set of levels, Mega Man stressed a particular order of doing things. 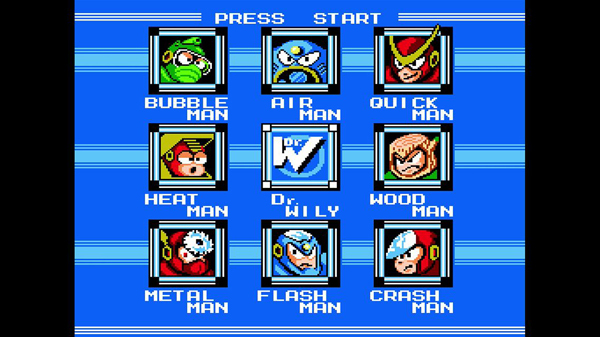 Each robot master had a special ability to be acquired and used against specific robots and without them, bosses were difficult to defeat. Determining the proper route turned the level select screen into a puzzle, a mechanic that stayed intact through all six Mega Man adventures. 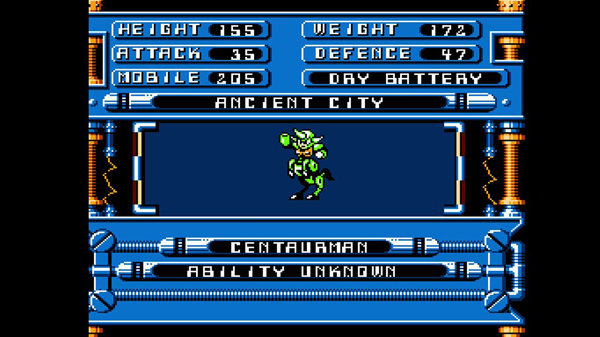 The domains of the robot masters were designed around their peculiar attributes. Air Man’s stage set the action largely in the sky, Wood Man found a home in a forest, and Heat Man’s stage utilizes a lot of fire-based obstacles. Quite a few Mega Man games would put the player through a series of screens before reaching the boss room. Later games, however, would up the difficulty/challenge by injecting mini-boss encounters halfway through a level. There are so many iconic elements in the Mega Man series. The level select screen, the music that plays before the start of a level, and Mega Man’s signature explosion. None, however, are more notorious than the game’s unflinching difficulty. Neither age nor a help save/load system, has not made the games any easier. It’s a small mercy to save the game before a particularly brutal level run or tricky boss fight--to save on player lives--but getting through a stage requires careful analysis, a commitment to action, knowing the character’s limitations, and a whole heap of luck. The Blue Bomber is set up against insurmountable odds in every stage, from enemies with annoying and hard to predict move patterns to devious traps and obstacles. And because of the game’s early technology, enemies respawn if you leave and re-enter a previous screen. This is especially annoying for those situations where an enemy contact pushes you back a screen and having to fight them all over again. Mega Man is devious and challenging, so gamers with anger issues might want to install padding in their home. As if the games weren’t hard enough, I found myself fighting with the Xbox One’s default controller. To me, the games are nigh unplayable with the analog sticks and the D-pad just wasn’t up to snuff. Because it’s recessed into the controller more than the Xbox 360 design, I found that it wasn’t as responsive enough. For the level of precision Mega Man demands, the Xbox One controller just doesn’t feel designed to handle the rigors of old school play. I have yet to see many games this generation that didn’t relegate the control to something other than menu inputs or quick weapon selection. This is a situation where I desperately want the big, chunky, and uncomfortable d-pads of yore. For those out there with the $150 Elite controller, I’d like to know if it plays differently. Mega Man has made a huge impact on the video game industry and earned its place in history. There may be no chance for an entirely new game sanctioned by Capcom any time soon, so the Legacy Collection scratches the itch until Mighty No. 9 is unleashed. The games offered in this collection are difficult and will challenge even the most seasoned gamer. A Challenge mode remixes a lot of the action, offering snippets of gameplay across various levels segments from each game, boss rushes, and if you're good enough to unlock it, a boss rush that runs through all six games. Bonus content includes soundtracks, artwork, and an expansion encyclopedia for all Mega Man games in the set that offers concept art and information on all characters, enemies, and bosses. It's a nifty little package of content that will be more meaningful to the older set as opposed to newer gamers. Capcom may not be wholly interested in greenlighting a modern interpretation of the series, but the collection is a great opportunity to experience video game history - if you haven't already. For those looking for old school challenge or experience the definitive version of the early Mega Man classics, look no further than the Mega Man Legacy Collection.